Tracy Whitney never wanted to settle down. Responsible for some of the world's most astounding heists with her brilliant, charming partner Jeff Stevens, she's enjoyed the danger and relished the intensity of life on the wild side. But she's had enough of conning the rich and corrupt out of their ill-gotten fortunes. The one thing that would make her life complete now is marriage and a child with Jeff. But first, Tracy must finish one last job. An unexpected encounter with an old enemy triggers a series of disturbing events that Tracy never anticipated, raising terrifying ghosts she thought were dead and buried. Once again, this clever woman finds herself out on the edge, playing the odds in a desperate game of roulette. The stakes have always been high. But with her life and her future on the line, Tracy needs to dig deeper than she's ever gone before and find the strength and courage to trump her rivals, no matter what the cost. Tomorrow has come at last. But it isn't the future Tracy bargained for . . . Sidney Sheldon's most popular and enduring heroine-- Tracy Whitney of If Tomorrow Comes --returns in a sensational sequel full of passion, suspense and breathtaking twists. 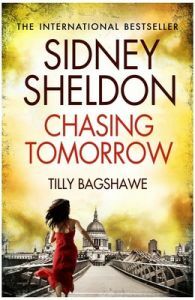 Tilly Bagshawe is the internationally bestselling author of three previous novels. A teenage single mother at 17, Tilly won a place at Cambridge University and took her baby daughter with her. She went on to enjoy a successful career in The City before becoming a writer. As a journalist, Tilly contributed regularly to the Sunday Times, Daily Mail and Evening Standard before following in the footsteps of her sister Louise and turning her hand to novels.Tilly's first book, Adored, was a smash hit on both sides of the Atlantic and she hasn't looked back since. She is married to Robin Nydes, an American businessman and former investment banker and the couple have two young sons as well as Tilly's daughter Sefi. The family divide their time between their home in Los Angeles and their beach house on Nantucket Island.